Tricky Bird ID is a bird identification challenge run by Jason Ward (@JasonWardNY), the community relations and outreach coordinator for the National Audubon Society and host of the web series Birds of North America. He started Tricky Bird ID to break down the basics of bird identification. On an ideal week, he posts a photo of a bird on Monday, Tuesday, and Wednesday at 8PM ET. He tries to use photos where the birds are hiding, or in motion, to make the experience more lifelike, Ward says. “Birds don’t often pose on a nice, well-lit, beautiful branch out in the open,” he says. This quiz is more like a scavenger hunt. On Fridays around 9AM PT, Seattle-based naturalist and writer Kelly Brenner (@MetroFieldGuide) posts clues to a creature’s ID and also sometimes gifs of Tom Hiddleston as Loki. (This is an observation, not a complaint.) Brenner’s quizzes tend to center around plants or animals that are under-appreciated and under-noticed. “My only rule is it has to be found in a city,” Brenner says. Earyn McGee (@Afro_Herper) is a PhD student at the University of Arizona studying lizards in arid environments, and whether drought and climate change could screw up their food sources. She also studies how to harness social media to bring more African American women into careers in land and water management. Those two interests come together in #FindThatLizard, a two-day challenge that starts on Tuesdays at 12PM MT when McGee posts a photo of a lizard with a different hashtag: #GuessThatLizard. Based on a snapshot and a few details, people have to guess the name of the lizard in the photo. That’s the lizard that people will have to spot hiding in the next day’s challenge: #FindThatLizard. Inspired by other animal ID hashtags, ecologist Michelle LaRue started Cougar or Not back in 2015. She was working with a research nonprofit called The Cougar Network, which had a big database of photos of possible cougar sightings. “I thought it would be a fun game, hopefully educational, and it would give me a chance to do science communication about cougars, predators, and what Cougar Network does,” LaRue says in a direct message on Twitter. The challenge starts at 11:30AM CT most Fridays, and LaRue keeps tweeting the same photo for two hours before she reveals whether the photo was in fact a cougar, or not. There isn’t really a winner to the game — unless you count the graduate student who’s analyzing the responses to more than 100 photos for her master’s degree. Now, every Wednesday, Swift posts a photo at 11:30AM, and her followers have to guess if it’s a crow, or no. “A crow is any bird with the word crow in its recognized English common name,” Swift says. That could include American crows or Mariana crows, for example. There are a lot of options. So part of the payoff for the challenge is learning the basic birding skill of recognizing these birds. 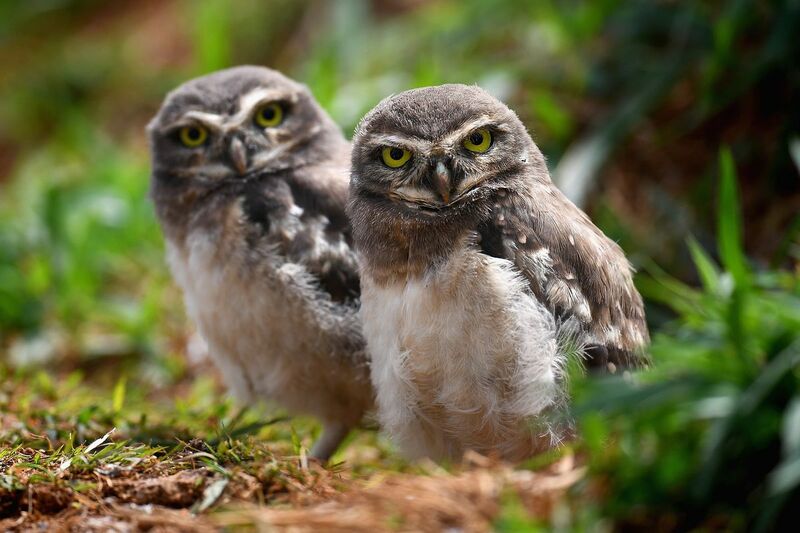 “But it also became a way to teach people about the global biodiversity of this family and this genus of birds,” Swift says. Danielle Rivet (@grizzlygirl87), a PhD candidate at the University of Saskatchewan, posts an ambiguous bear photo on Twitter on Tuesdays around noon CT with the hashtag #KnockKnockWhosBear. Her followers respond with guesses about the bear’s species and reasons for the guess, and after an hour she gives them a hint by tweeting the bear’s location. Three hours later, she posts the ID along with the characteristics she used to identify the species. The challenge started because Rivet spends a lot of time looking at bear photos from her work with a camera trap database at Wapusk National Park in Canada. The camera trap is set up to monitor polar bears, but black bears and brown bears wander into frame, too. And they can be tough to tell apart. “Even for someone who has worked with bears for a long time, it can be challenging to determine what species you’re looking at,” Rivet tells The Verge in an email.